‡Present address: Sanders Associates, Nashua, N. H. 03060. Various techniques for fabricating optical waveguides for laser-oriented applications are being studied. 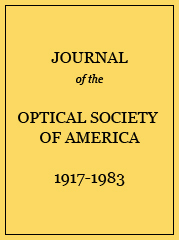 A technique utilizing radiation-induced changes of refractive index in optical materials is presented; the particular waveguide considered is a fused-silica slab that has been irradiated with protons to produce a channel with a refractive index slightly higher than the unirradiated silica. This high-index channel serves as the waveguide core and the surrounding unirradiated region as the cladding. Formulas for determining the size and shape of the high-index channel and the amount of index change have been developed. The primary waveguide parameters, core size, and refractive-index difference, may be adjusted by controlling proton energy and dosage, respectively. The technique is useful for formation of waveguides with core widths of 1 to 50 μ and index differences of 0.01 to 0.0001; it is particularly suitable for forming complex arrays of waveguides and waveguide components. Preliminary experimental work has used 1.5-MeV protons and dosages of 1014 to 1017 protons/cm2. Light propagation has been observed in waveguides formed by this technique.